PANET, BONAVENTURE, merchant, politician, militia officer, office holder, and jp; b. 27 July 1765 in Montreal, son of Pierre Panet* and Marie-Anne Trefflé, dit Rottot; d. 12 March 1846 in L’Assomption, Lower Canada. Bonaventure Panet came from a family of 17 children, the first 6 of whom died in infancy, and his chief claim to distinction was to have been a member of the first legislature of Lower Canada. At the time of election for Leinster on 11 June 1792 he was already well known in L’Assomption. He had established himself there as a merchant a few years after the period 1775–82, which he had spent at the Collège Saint-Raphaël in Montreal. Like most rural ridings, Leinster had two members, and another merchant from L’Assomption, François-Antoine Larocque, was also elected. Scarcely a month later Lârocque and Panet petitioned for 1,200 acres apiece to the north of the seigneury of Saint-Sulpice. They were doubtless disappointed that the land committee of the Executive Council granted them only 200 acres each, in Rawdon Township. The decision about the remainder was postponed until a surveyor’s report had been submitted. Eight years later, on 28 March 1800, Panet made a new request for 1,200 acres, but it was turned down. At the opening of the first session of the House of Assembly on 17 Dec. 1792, Panet took part in the noted debate on the choice of a speaker, which saw the first clash between French- and English-speaking members. He helped elect Jean-Antoine Panet*, a cousin, to the office, whereas his brother Pierre-Louis* voted against him. 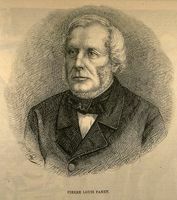 Panet was manifestly on familiar ground, indeed at home, in the assembly, where in addition to his brother and his cousin he found himself in company with his wife’s brother-in-law Pierre Marcoux* (the husband of Marie-Anne Dunière), his cousin by marriage Pierre Guerout*, and his father-in-law Louis Dunière*. Panet had married his cousin Marguerite Dunière, daughter of Louis Dunière and Élisabeth Trefflé, dit Rottot, on 18 Nov. 1786. Surprisingly, the ceremony had been performed by Anglican minister David-François de Montmollin*. Then on 6 April 1787 the couple had had their union blessed by a Catholic priest in the cathedral of Notre-Dame at Quebec. Panet was re-elected in 1796 and sat in the assembly until 4 June 1800. His political career subsequently suffered an eclipse, and he did not become member for Leinster again until 1809. 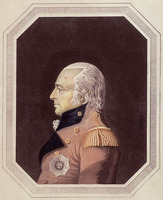 This time he sat for only a short while, since Governor Sir James Henry Craig* dissolved the legislature on 1 March 1810. Panet came back to live the last 12 or so years of his life at L’Assomption and he died there on 12 March 1846. At the time of his death he was a widower. He and his wife had had a son and three daughters, but only one daughter outlived him. ANQ-M, CE1-51, 27 juill. 1765; CE5-14, 15 mars 1846. ANQ-Q, CE1-1, 6 avril 1787; CE1-61, 18 nov. 1786. La Minerve, 16 mars 1846. Quebec Gazette, 31 May, 21 June, 20 Dec. 1792; 4 May, 19 Oct., 9 Nov. 1809; 22 May 1817; 23 April 1818; 20 April 1820. F.-J. Audet et Fabre Surveyer, Les députés au premier Parl. du Bas-Canada. Desjardins, Guide parl. 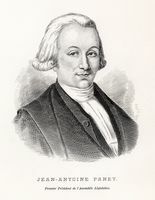 Marcel Fournier, Rawdon: 175 ans d’histoire (Joliette, Qué., 1974). Christian Roy, Histoire de L’Assomption (L’Assomption, Qué., 1967). P.-G. Roy, La famille Panet (Lévis, Qué., 1906). F.-J. Audet et Édouard Fabre Surveyer, “Bonaventure Panet,” La Presse, 17 sept. 1927: 61, 76. P.-G. Roy, “Le premier Parlement canadien,” BRH, 1 (1895): 122. Roger Barrette, “PANET, BONAVENTURE,” in Dictionary of Canadian Biography, vol. 7, University of Toronto/Université Laval, 2003–, accessed April 21, 2019, http://www.biographi.ca/en/bio/panet_bonaventure_7E.html.